August home sales in Key West saw a significant increase in sale prices alongside a steady rate of overall sold listings; residential real estate held strong as summer began to wind down. Sale prices climbed significantly, with the average list price for August 2018 at $898,278 compared to $697,142 a year ago. This is a 28.85 percent increase in year-to-year data. Median list prices for the month came in at $635,000, up by 6.28 percent from $597,500 in August 2017. Listing prices for August were in line with sale prices, with home sellers listing their properties at an average of $923,753, up by 3.03 percent from the previous year. Median list prices went up as well to $625,000, a 6.56 percent increase compared to 2017. If you look at both median (mid-line) prices, sellers are pricing homes in line with the demand for Key West Properties. While owners are seeing a median of 1.6 percent more than their asking price, this equates into $10,000 more in funds; now is a great time to sell Key West properties. August’s sales report shows 40 properties sold in Key West, compared to 46 transactions completed in August 2017, a 13.10 percent decrease. Year-to-date sold listings show Key West is holding steady with the year in overall numbers sold, with 424 listings sold so far, compared to 426 last year for the same period. The steady rate could easily climb higher over the next several weeks as there were 33 pending sales by month’s end, and another 76 listings added to the market. There was a total of 496 active listings in August, with most of them ranging between $250,000-$1,499,999. YTD Active listings total 1,152 with a total of 668 new listings coming onto the market so far in 2018. Whatever your budget and lifestyle needs, there’s sure to be a Key West property for you. 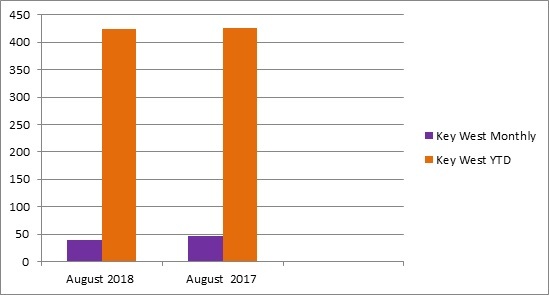 Days on the market were dramatically fewer in August compared to the year prior. The average days on the market for listings sold last month was 117 compared to 180 days a year ago. Homes sold on average 2 months faster than in August 2017. 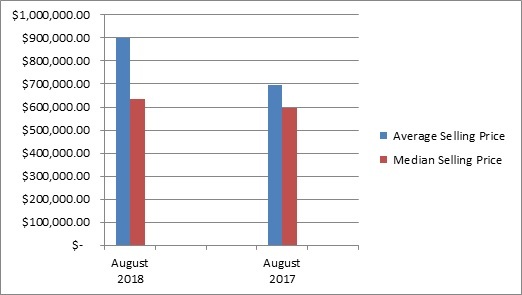 Median days on the market went down to 57 days compared to 97 in August 2017. The rate at which Key West properties are selling reflects the ongoing demand for homes in the area; Key West is where people want to live, and where home buyers are finding properties they want.